Decent day at the pier today. Personally—1 Sand bass, 2 Thornbacks, 1 Lizardfish, 3 White Croaker, 2 Mackerel, 2 baby Grey Smoothhound and about 15 Salema, some of which were 6”-7” (which is pretty good size for Salema!) Saw a good-sized (about 3 feet) grey smoothhound landed and several undersized halibut. Salema were the rule today, as many people had several in their buckets. I did see one of the craziest things that I’ve ever seen today; these kids had “Pixy Stix” candy mixed with water and were injecting it into their bait and were smokin’ everybody on the pier. These guys were landing fish left and right! Their day did end abruptly, however, when after one of them landed a stingray and after being warned by yours truly about the stinger in the tail, one of them got stung in the wrist. I suggested they high-tail it home and gave them the first aid procedure for taking care of it. Memo to beginners: Stingrays are not toys, handle with caution!! Tight lines to all! 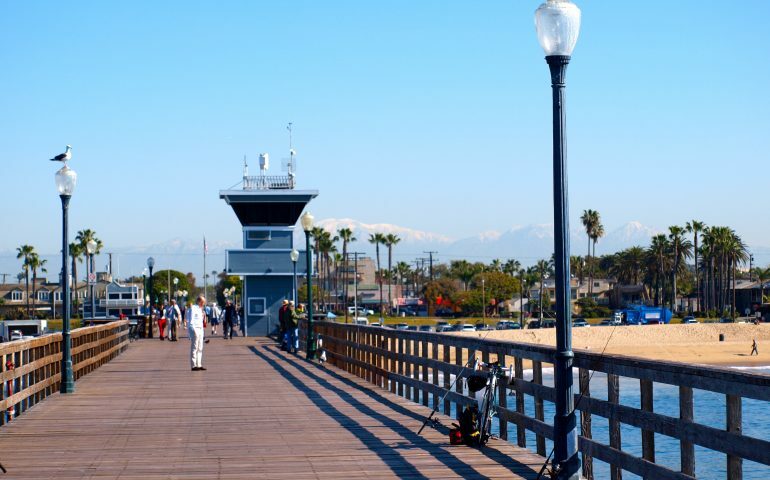 We hit the Seal Beach Pier this morning 5 a.m. till noon; the halibut were biting everything. 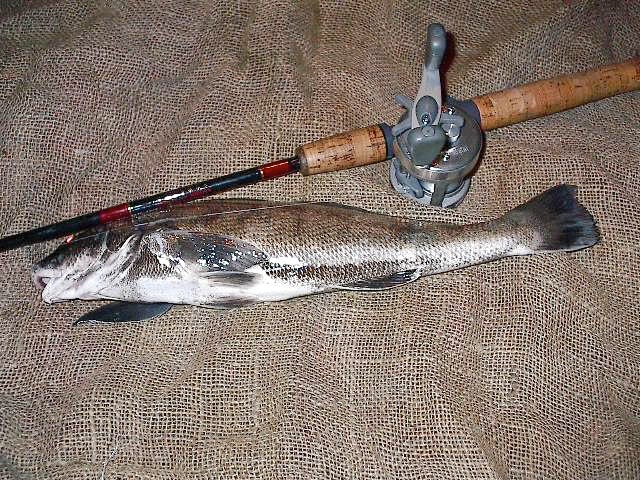 One keeper was landed (24”) while dozens of undersize ones were being tossed back. There was some barracuda action on the end, while corbina and croakers were hitting in the middle of the pier. Many parents brought their kids and most of them had a great time jigging Lucky Luras and catching lots of queenfish. The weather was overcast with a mist all morning and the sun didn’t make a showing while we were there. The pier was crowded in the early morning and stayed that way, but still ample room to fish. It seems that Ruby’s is remembering to lock the end gate at night, but if your lucky there’ll be a delivery truck to break it open for you like this morning. If you’re looking for halibut, use live bait and drop your line straight down almost anywhere along the pier. Corbina have been caught up in the surf and some sargo inside the breakwall lately. Perch bite has dropped off. The sharks and rays are generally taken more from the deep end, but do sneak into the shallower water depending on the tides, availability of bait, etc. Use live smelt, queenfish, chunk mackerel, or whole squid for the big boys and cast out as far as you can. There is an artificial reef along the deep end of the north side. That is the only spot I’ve ever caught bass, but watch for snags in that area. Never had a problem catching plenty of live bait with a Sabiki at Seal. Finally made it out to a pier on Friday night as the Mrs. gave me a break from baby duty. Got to the pier with Grandpa about 4:30 PM and he waited a few minutes while I attempted to catch sand crabs on the north side of the pier. Big mistake. After about 15 minutes, I had maybe six crabs for my efforts. Went up on the pier and got him situated on the first benches over the water while I went back to try for more sand crabs. Tip: get your crabs on the south side of the pier. Even better under the pier, but watch out when big waves come in and crash into the pilings. Sends spray everywhere. Prepare to get wet and maybe bring some dry clothes. Jimbojack’s grandpa and his corbina! So we fished in the surf area for a few hours and I caught one 6” yellowfin croaker. We moved to the benches just opposite the tower and Gramps tosses out a larger sand crab on a #2 hook. Meanwhile I brought in a decent 11” yellowfin croaker, when BAM! Gramp’s pole goes off and he’s got a real fight on with his lightweight gear. Gets the fish up by the pier and we were reluctant to drop the net because the end of the seawall is right there. So he asks me to handline it up and I was nervous the whole time as I thought the fish would fall off at any second. It was just getting dark and at first I thought it might be a small WSB, but as I got it a ways up I could tell it was a big corbina. It was the biggest he has ever caught in 70 years of fishing the Pacific and would not part with it. 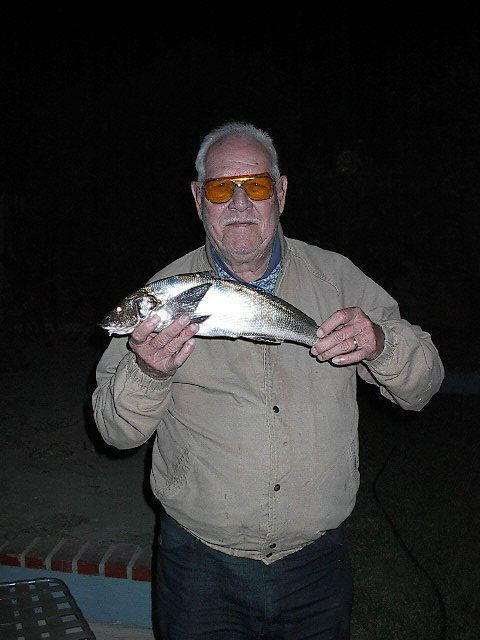 (Sorry Mola Joe) Grandpa was real excited as he doesn’t fish much any more and usually has rotten luck when he does. Caught a few more small croaker on sand crabs and thin strips of squid. Didn’t get a chance to post until now. My daughter who just turned seven months cuts into message board time. I don’t mind one bit. Got out to the pier with my grandpa about 4:30 PM and it was a little breezy. He went on the pier, I went for the shore. Very few sand crabs and very tiny. I was putting 4 at a time on my # 6 hook. Only a few subtle hits and no hookups. Maybe I should try Mola’s technique and let it go in freespool as it seemed the fish were just mouthing the bait. Tried lugworms and grubs with no luck. Went on the pier at dark and met a guy named Nick. He was at the fish cleaning station with what looked to be some good-sized corbina and yellowfin croaker which were beheaded and gutted. Date: May 27, 2004; To: PFIC Message Board; From: oldmanandthesea ; Subject: Using cut squid and store shrimps good bait?